By Default Ubuntu’s APT doesn’t delete any package files because of the reason that it might be used in futures,although which happens rarely due to the new version releases of softwares and applications.So your computer’s space will be wasted by unnecessary packages and files;it increases each time when you install or remove some packages.That’s why it is recommended to remove those unwanted packages and files to make your computer clean and fast. 1. Open Synaptic Package Manager(from system->Administration->). 2. Click on Setting->preferences,then click on the Tab named as Files. 3. 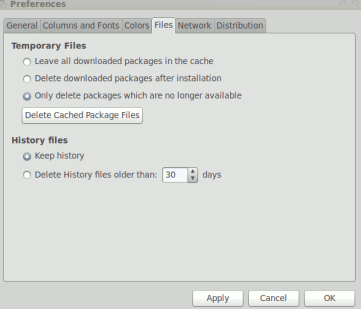 Next,click on Delete Cached package Files and select the correct options in the above radio button.Yo can also delete history files according to your choice. 1. Open terminal or linux shell from Applications->Accessories->Terminal or hit CTRL+ALT+T on Ubuntu 10.04. 2. Type the following command and hit enter.It may ask for the password,enter you login password. Firefox : click on Tools->Clear Recent History or Hit CTRL+SHIFT+DEL.A small window will appear then select “clear everything” from the options and then check the boxes that you want to delete.Now,click OK to finish. Computer Janitor is default application installed on Ubuntu 10.04 to perform cleaning task by removing garbage files and unnecessary applications.So You can also use computer janitor to clean your ubuntu computer by removing unnecessary files and programs.It is installed by default.You can access it from System->Administration->Computer Janitor.